It all began innocently enough, I suppose. Two years ago my friend and seminary classmate the Rev. Tim Schenck thought it would be both fun and educational to put the Church’s saints in competition with one another for the coveted (may we say that about saints? he did) Golden Halo, and to set up said competition in a single-elimination bracket a la the NCAA basketball championship tournament “March Madness”, which as any good churchgoer knows always manages to occupy Lent no matter what the date of Easter. Add a thorough search through the heavenly roster of the communion of saints for the first set of 32 candidates, and “Lent Madness” was born. Votes were cast via Tim’s blog, “ClergyFamily Confidential”; the winner was George Herbert, the 17th century English priest and poet. Building on his success in the 2010 competition, Tim offered it again last year, but with a whole new collection of saints. (Unlike Duke and the University of Kentucky, to name a few, I don’t recall any repeats in this “Madness” from year to year – so far. And if, as I recommend, the recent publication Holy Women, Holy Men becomes the resource of choice for the so-called “saintly smackdown” - I think we’re mixing sports metaphors here - there won’t need to be any until long after the “Table to Find Easter Day” in the back of The Book of Common Prayer runs out in 2089, the same year my younger child turns 100. But, I digress.) Last year’s winner was C. S. Lewis. I see a pattern already. And now, as if the Anglican Communion wasn’t fractured enough, and less than one week after the end of the Week of Prayer for Christian Unity, this rivalry in religion has hit the big time. Tim is partnering with Forward Movement Publications and its Executive Director, the Rev. Scott Gunn, to take Lent Madness to the masses (of people). Frs. Gunn and Schenck have given the competition its own website, invited celebrity bloggers to weigh in, and are featuring a weekly video “Monday Madness”. It’s an impressive list of contestants this year, including several Archbishops of Canterbury. Augustine of Hippo, evidently having listened closely to Jesus, goes up against his mother, Monnica (nice touch, guys). Will Paul of Tarsus, not running aimlessly, defeat Theodore of Tarsus in the first round and, being all things to all people go all the way? How far will Philander Chase the Golden Halo? Will Brigid lose out to Rose of Lima? And what about Rose of Sharon? Seriously, Lent Madness is an impressive piece of work. It’s fun, it’s clever, and it really does fulfill its mission to educate about that vast “cloud of witnesses” in a way that’s entertaining and engaging. It’s also a much healthier mix of religion and sports than the Sunday morning youth athletics vs. church attendance that most of us face in our parishes. Who says a Lenten discipline can’t be enjoyable? Some, I suppose, but I’m not one of them. So, “I heartily endorse this game” and urge you to give it a try. Two years ago I followed the saintly Mr. Herbert all the way to victory, and it was tremendously rewarding. The contest begins on Thursday, February 23 with daily match-ups until the winner is, um, elected. “Forward Day by Day” suddenly has a whole new meaning. P.S. On the Lent Madness website we’ve been warned to vote only once per match-up because “this isn’t Chicago”. Actually, Tim, for some of us it is. 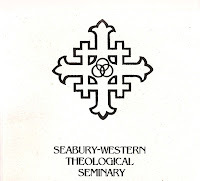 I first entered the main building of Seabury-Western Theological Seminary in April of 1997 as a newly minted postulant and prospective student, through those heavy wooden doors just off the parking lot. What I discovered wasn’t modern and institutional; it didn’t look like a school or university, even though it was situated on a Big Ten campus. It looked, and felt, like a place where religious community flourished. It even smelled right. I may not have been sure what I sought when I entered that building, but my gut (and isn’t that where the Holy Spirit resides, after all?) told me I belonged here. The mechanics of enrollment and planning for a vastly different life followed. My husband was prepared to make tremendous professional sacrifices to I could pursue my calling. Through it all I never doubted that call, and I never doubted that I belonged at Seabury. Places sometimes take hold of us. The setting, people, situations, and experiences all combine to create a deep sense of what Kathleen Norris calls “spiritual geography”. Seabury became that for me. There was the chapel, the place where we gathered as many as three or four times daily to immerse ourselves in the Daily Office or celebrate Eucharist. It was the place where many of us first led worship, officiating at Morning Prayer or Evensong or gathering in the late evening, praying Compline by candlelight. We greeted Jesus’ resurrection at the Great Vigil of Easter. Babies born to seminarians were baptized here. When our all-too-human words and actions offended, it was often here that we were reconciled to God and one another. The chapel was central, but the community was more than that. We held family/community evening Eucharists weekly, usually in Seabury Lounge. At one of these I witnessed my son, only eight years old, turn and give the Body of Christ to the bishop-elect of New York, then-Dean Mark Sisk. (Does anything like that ever happen in a parish?) We groused about the food in the Refectory, and about the living conditions in the student apartments. We learned from an exceptionally gifted faculty, who treated us as colleagues. We studied in the library and in the basement room known affectionately (?) as “Purgatory”. I held my classmate’s baby son while he preached in the parking lot at “Mass on the Asphalt”. Living “on the block” was a particular gift to my family, especially my young son and daughter. For years they had heard their parents talk about the importance of tolerating and accepting human diversity; at Seabury it was incarnate and they, and we, learned to embrace it. Life in that community wasn’t painless, and it wasn’t perfect. But it was right. 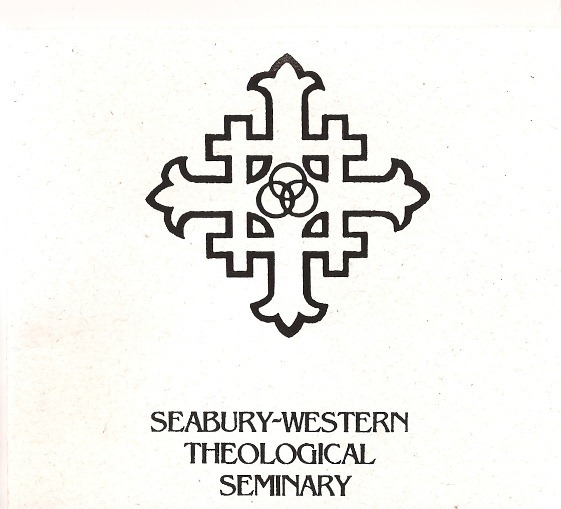 Several years ago Seabury made the very difficult decision to cease its residential M.Div. program, thus ending nearly 150 years of a time-honored and very specific system of theological education. The trustees advised most of the remaining faculty and staff that their jobs would soon end, and agreed to sell the property to Northwestern University and lease it back for use. Seabury would be “what’s next” in a seminary. Grief among graduates manifested itself in anger with the board. How could future Episcopal clergy possibly function and minister in the Church without a traditional seminary education? Last Friday, the Feast of the Epiphany, the staff, faculty, trustees and many graduates of Seabury gathered for an extended liturgy that began with a leave-taking of the old chapel as the seminary made a journey from the physical space it had called home for so many decades and, going home by another way, moved into a new space in Chicago near O'Hare Airport: smaller, less burdensome financially, and much more accessible for both clergy and laity seeking a new kind of theological and spiritual formation for the missional Church we must all reclaim if we are to continue to spread and live into the Good News. Here in this new space the liturgy continued, dedicating it as a center for prayer, formation, and communal life right smack in the middle of the marketplace where cross the crowded ways of life. The Church in the world – not painless, not perfect, but right. I’m proud to be an alumna of a seminary that took such a courageous step, and that continues to model faithful risk-taking. The memories that I and my fellow alumni/ae treasure, the formation we received will always be with us, and no one can take them away. But I would never be so presumptuous as to suggest that future leaders of the church want, or even need, those same experiences. We are waking up to a new and necessary reality, and Seabury is in the vanguard. The One who makes all things new is clearly at work, and I can’t wait to see what’s next!